Amy McManaway graduated from massage school in 1993. 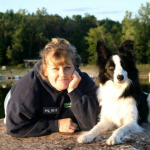 She has achieved multiple certifications and has worked closely with many doctors and veterinarians. Amy’s goal is to help people heal themselves. She also teaches people to help heal their horses and dogs by building a bond and relationship with them. She uses multiple types of massage, microcurrent, lymphedema management, and exercise for a lifetime of improved health. She continues to educate herself and her clients. “You can never learn too much” is Amy’s motto. It all started with my parents. On a farm, animals are often a commodity and not given an opportunity or a helping hand to heal. Growing up on the McManaway farm, things were different. My dad tried his best to heal all of the animals. Doing so may not have been best for the farm’s bottom-line, but his heart taught me that life is a gift to be cherished and nurtured. My mother taught me that honesty, integrity and faith will help you on your journey. Together they made me who I am today, which translates to caring and compassionate care of humans and all animals large and small. In the late 1980’s I noticed that people and animals were being put on more and more medication…joint injections, surgeries, etc. I felt there had to be another way. That was the start of my holistic journey. I graduated massage school in 1993. Since then I have attained over a dozen certifications through continuing education. I have worked with many doctors and veterinarians on cases of soft tissue injuries, swelling and scar tissue. In 2012 I graduated from The Norton School of Lymphatic Therapy, one of the top schools in the country. In 2015, I gained official charter certification for equine lymphedema from the Holistic Equine Academy of Lymphedema and am at present one of only four individuals certified in the United States.